The 5th of December will see the closing of all lands north of the Cannonball River. The Army Corps of Engineers made the announcement, which will also include the closing of the Oceti Sakowin protest camp. The roster of veterans is said to stand at over 2,100 members who plan on coordinating a shift roster. 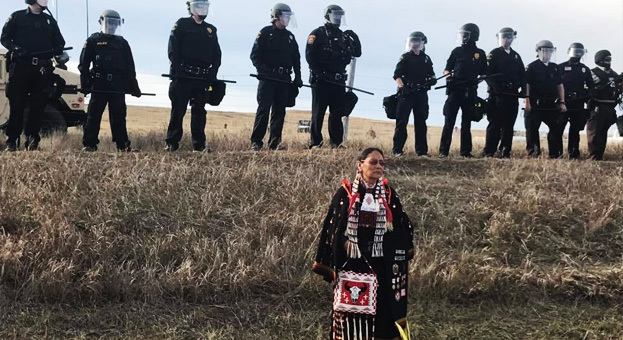 Recently, in light of the planned crackdown to officially block access to the land, and thus, halt the protests, it’s reasonable to expect that those already assisting with and acting as protection for Energy Transfer Partners (ETP) – the company behind the DAPL project – that the protestors will be forcibly cleared out, most likely by the National Guard and “militarized police forces,” The Free Thought Project predicts. And it’s not an unwarranted prediction. “I’ll ultimately be paid by the oil people dealing with the protests. I’m guessing when all of that is finally over and the dust settles, the oil company is going to want all the paperwork for reimbursement. I figured I should have some formal form instead of writing hours on a napkin (smiley face). Thanks.” A man named Tyler Falk responds to the Stutsman County Sheriff Department’s April Anderson. As Unicorn Riot points out, the “oil company” is the ETP. It is also important to point out, as Unicorn Riot suggests, that there is no direct evidence of ETP paying the police, however, the email does suggest otherwise. ETP’s CEO Kelsy Warren told CBS earlier that the company was willing and offering to pay for the costs incurred by the protests. According to CBS reporter Mark Alpert, the authorities have yet to accept the offer. If the police are to be paid by the ETP, the ballgame, legally, has changed. The police then become nothing short of mercenaries – private guns for hire.